The Atlas Copco LHD 23 M handheld hydraulic breaker is available in Rochester NY, Ithaca NY and Upstate NY from the Duke Company. 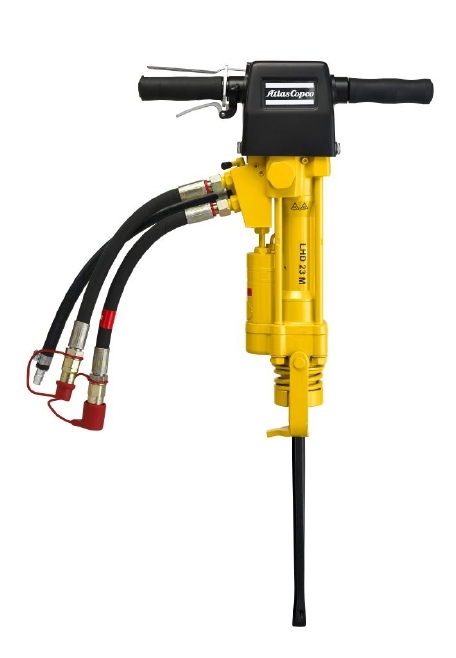 This lightweight Atlas Copco rock drill is designed for drilling blast, anchor and rock splitting holes. The LHD 23 M rock drill is used by professionals who want a convenient and efficient way to drill without a large compressor. Using standard integral steel, it drills diameters of up to 2 inches and depths down to approximately 20 feet. The LHD 23 M uses hydraulic power for impact as well as rotation. An additional 15 – 20 cfm small compressor is needed for flushing. A drifter version for separated operation of impact and two way rotation is available.